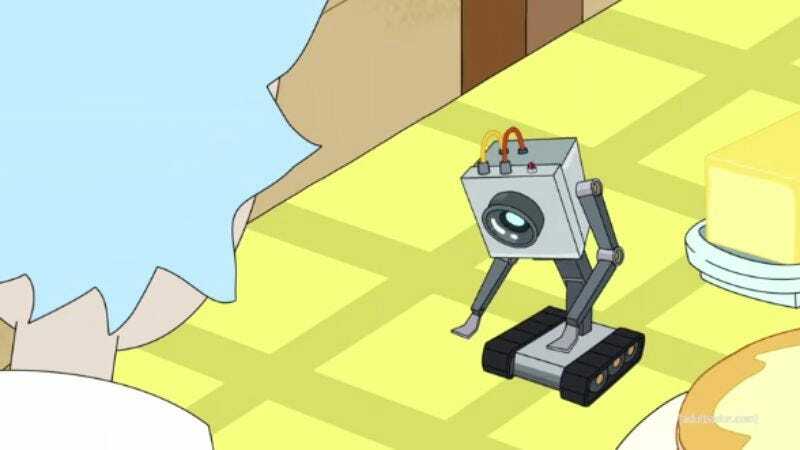 In one of the many tiny vignettes of existential despair tucked away within Rick And Morty’s two-season-so-far run, the hard-drinking, adventuring scientist Rick creates a tiny sentient robot for the express purpose of serving butter. “What is my purpose?” it asks shortly after being created, almost pleadingly, to which Rick responds, “You pass butter.” It looks at its tiny claws and moans, “Oh, my god,” before the credits roll. Perhaps yearning to give that creation something more to live for, one enterprising inventor at RoboGames—the largest robot competition in the U.S.—recreated the butter-passing robot. This time, instead of serving butter, it shoots flames out of its arms in an attempt to destroy the centrifugal power of its opponent, the T-800. How does it fare? Eh, not super well. The butter-passer is top-heavy, much better designed for experiencing flickers of sentience and moving butter than engaging in industrial warfare. As is often the case in robot death matches, the whole thing ends a little anticlimactically, with both robots lying sideways, presumably beseeching their gods for an end to their futile, meaningless existences.